The military operation recorded in war history as being the most successful during the Winter War was the defeat of two Soviet divisions in battles in the Suomussalmi area. This success was preceded by the major setback of the Soviet 163rd Rifle Division capturing Suomussalmi during the very first week of the war. The General Headquarters concentrated approximately one division of additional troops in the Suomussalmi area. These troops first defeated a rifle division of the Red Army at the end of December and then another rifle division, which had tried to advance to Suomussalmi, on the Raate road at the beginning of January. The wartime mission of the separate battalions (16th SepBn and 15th SepBn) of the North Finland Group that were formed in Kuusamo and Suomussalmi was to launch an attack to Ukhta. In turn, the mission of the rifle division (163rd RD) that attacked at the centre of the Soviet 9th Army was to advance to Suomussalmi and further to Oulu via Puolanka. Reservists from Kuusamo and Posio started to arrive at the Kuusamo Training Centre for the additional refresher training of autumn 1939 on 12 October. The training centre’s core was formed by the 3rd Company of the Lapland Border Guard District, which operated in Kuusamo. The training centre’s personnel strength was more than 1,700 men. The training centre formed a separate battalion (16th SepBn) and one separate company (SepCo Seppälä) that was not part of the mobilisation plan. The latter was responsible for the operation of the Border Guard stations. The mission of the separate battalion (16th SepBn) formed in Kuusamo was to defeat any enemy troops advancing towards Kuusamo and prepare to advance towards Pistojärvi and further to Ukhta. The 3rd Company of the Kainuu Border Guard District (3rd/KBGD) formed the framework of the Suomussalmi Training Centre. The centre received reservists from Puolanka, Ristijärvi (northeast of Kajaani), Suomussalmi and Hyrynsalmi. Its personnel strength was more than 1,600 men. The training centre established one separate battalion (15th SepBn) and one separate company (SepCo Kontula) that was not part of the mobilisation plan. Additionally, a Border Guard detachment was formed in the Juntusranta area and placed under the direct command of the North Finland Group Headquarters. The separate battalion (15th SepBn) was responsible for guarding the border in the area of the Raate road. The battalion’s wartime mission was not changed prior to the start of the Winter War. At the outbreak of war, the battalion’s mission was to advance along the Suomussalmi–Raate–Vuokkiniemi road and defeat any Soviet forces they encountered. The first target of the attack was Vuokkiniemi. The Soviet rifle division (163rd RD) that attacked the Suomussalmi area took Suomussalmi during the first week of the war. The division was commanded by Brigade Commander Andrey I. Zelentsov. His rifle division attacked Suomussalmi from the directions of both Raate (one rifle regimen, 759th RR) and Juntusranta. The majority of the rifle division attacked via the northern route, i.e. through Juntusranta. The two attacking regiments, a rifle regiment (662nd RR) and a mountain rifle regiment (81st MountRR), had advanced through practically roadless terrain, building a winter road. One of the division’s rifle regiments (529th RR) had been replaced by a mountain rifle regiment of the 54th Mountain Division (81st MountRR). The Soviet division reached the village of Suomussalmi, which had been burned to the ground by the Finns, from both directions of attack on 8 December. The Soviets had only attacked the Kuusamo area with a small force. After the start of the Soviet offensive, the North Finland Group relocated the battalion of the Field Reinforcement Brigade (IV/FRBde), which had been assigned to it from the General Headquarters’ reserves, to the Suomussalmi area. The separate battalion (16th SepBn) in the Kuusamo area was ordered to partly relocate to Piispajärvi. The battalion was later relocated there in its entirety. On 7 December, the General Headquarters subordinated an infantry regiment (27th IR) to the North Finland Group. The regiment in question belonged to the 9th Division, which had been stationed as the General Headquarters’ reserve at its place of establishment in the Oulu area. The division’s commander, Colonel Hjalmar Siilasvuo, was appointed commander of a brigade that was formed from an infantry regiment and a part of the division’s combat support troops. All the troops who were already deployed in the Suomussalmi area were also subordinated to Siilasvuo. The forces in the Suomussalmi area were formed into Group Siilasvuo. After the arrival of reinforcements in the Suomussalmi area, Siilasvuo’s forces launched their encirclement attack on 11 December. Its goal was to retake Suomussalmi. This goal was not achieved, but the group’s forces blocked the road leading east from Suomussalmi on the isthmus between Lake Kuormajärvi and Lake Kuivasjärvi. A detachment was deployed in the area to prevent additional enemy troops from reaching the rear of the attacking Finnish troops from the east. Offensives launched in order to retake Suomussalmi continued until Christmas. They were also related to offensive operations aimed at Hulkonniemi from the west. A bicycle battalion (BiBn 6) that arrived in the area after mid-December prevented the enemy from reaching Ylinäljänkä and disrupted the enemy’s transport operations from Hulkonniemi to the north. The first intelligence about a new Soviet division (44th RD) approaching from the direction of Raate was gained in mid-December. A separate battalion (16th SepBn) that had been relocated to Piispajärvi from Kuusamo repelled all attempts by an enemy regiment (662nd RR) to advance north. From 17 December onwards, the battalion deployed some of its forces to attempt an attack on the enemy’s rear route in Palovaara. More troops were concentrated in the Suomussalmi area at the end of December. A new 9th Division was formed under Siilasvuo’s command. It lacked most of the artillery, among other things. The newest unit concentrated in Suomussalmi was an infantry regiment (64th IR). Siilasvuo already had one infantry regiment (27th IR) and two battalions (15th SepBn and IV/FRBde) as well as other units under his command. Group Kari, which had been formed for the offensive, attacked Hulkonniemi from the west starting 27 December. The group was commanded by Major Kaarle Kari. The offensive by his group led to the enemy division’s withdrawal from Suomussalmi on 29 December. The enemy rifle division (163rd RD) used the ice of Lake Kiantajärvi as its retreat route and withdrew to Juntusranta. The 27th Infantry Regiment from Siilasvuo’s division was deployed on the east side of Suomussalmi. The infantry regiment was commanded by Jaeger Officer, Lieutenant Colonel Johan Mäkiniemi. 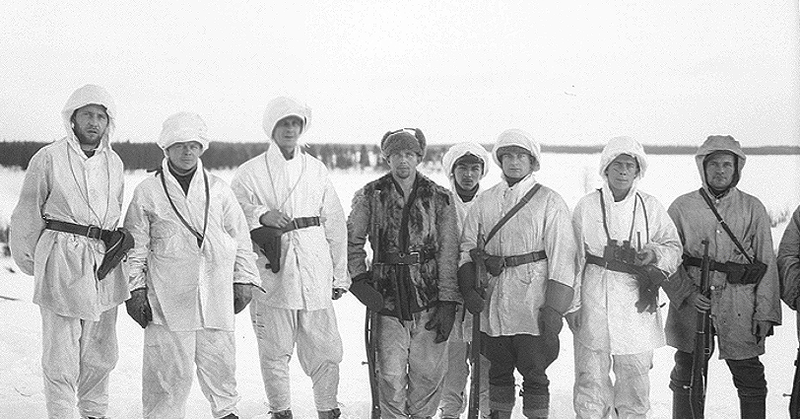 Soldiers of the 16th Separate Battalion near Lake Kiantajärvi on 1 January 1940. SA-kuva. A new infantry regiment (65th IR) was concentrated in the Piispajärvi area. The regiment was commanded by Lieutenant Colonel Oskar Mandelin. His regiment and the separate battalion (16th SepBn) that was already deployed in the area were formed into Group Susi and placed under the command of Lieutenant Colonel Paavo Susitaival. It fought against battle groups formed from the troops of the 662nd Rifle Regiment. Group Susi was subordinate to the North Finland Group. This meant that Jaeger Officer, Major General Tuompo commanded Group Susi as well as Siilasvuo’s troops from his headquarters in Kajaani. Siilasvuo and Susitaival were not in contact with each other during the fighting. Detachment Mäkinen, which was commanded by Captain Simo Mäkinen and a little under a battalion in strength, fought the vanguard of a Soviet rifle division (44th RD) that advanced towards Suomussalmi along the Raate road, stopping it on the isthmus between Lake Kuomajärvi and Lake Kuivasjärvi. Group Susi launched its attack from Piispajärvi on 25 December, advancing south along the road. The group’s first target was Palovaara, from where the group intended to attack Juntusranta with its main force. The group defeated one rifle regiment (662nd RR) of the 163rd Rifle Division with its attack, but its attack towards Juntusranta was launched so late that the enemy troops who withdrew from the village of Suomussalmi arrived there first. Juntusranta remained in Soviet hands until the end of the war.